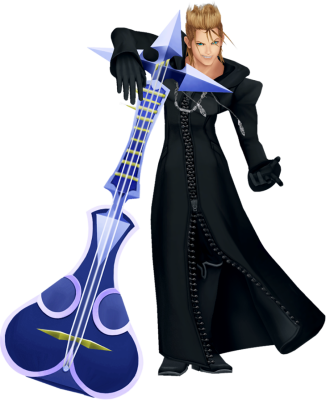 Demyx is a member of the original Organization XIII and possibly a current member of the “true” organization. Demyx is a very laid-back, lazy individual who has a tendency to sweep things under the rug and weasel his way out of having to do any work. In battle he wields a sitar, which he pairs with his power over the element of water to create moving music notes and copies of himself that he controls with the instrument. Despite his usually lazy approach to missions, Demyx is actually fairly competent in battle, delivering massive blows with his sitar that cause major damage. During the events of Kingdom Hearts 358/2 Days and Kingdom Hearts II, Demyx was a nobody, created when he lost his heart to darkness at an unknown time and place. He was ranked number 9 in the organization. While it is to be assumed that in Kingdom Hearts III he has returned to human form once again, his real name is still unknown.